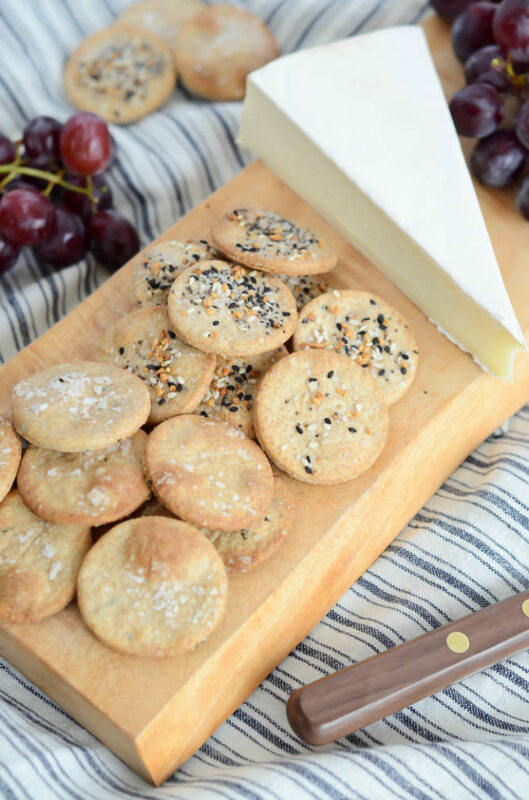 Homemade Whole Wheat Crackers: Two Ways! 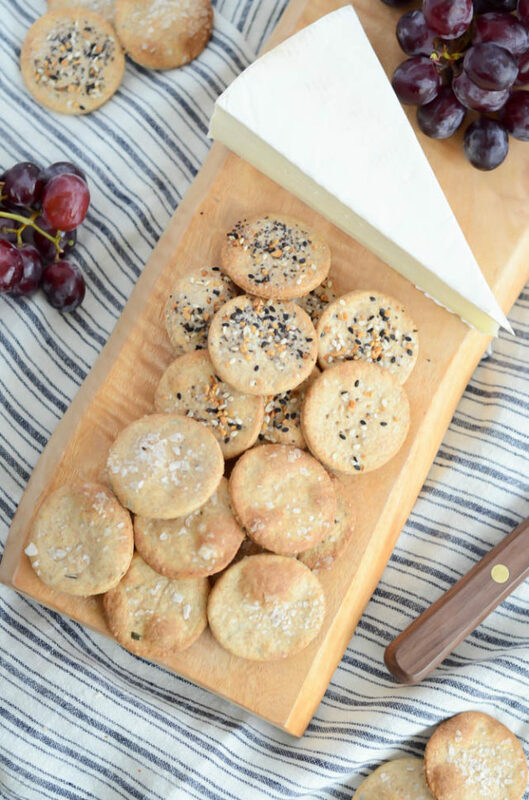 A simple homemade whole wheat cracker recipe with two flavor-filled variations – Rosemary Sea Salt and Everything Bagel! I’m about to blow your mind. Because today I’m bringing you a super easy recipe for Homemade Whole Wheat Crackers, and starting you out with two flavor combinations that will make you never want to use store-bought crackers ever again. That’s right, I’m taking your cheese and charcuterie platters to a whole new level. Do you ever fantasize about being a domestic goddess that has her world super together and the energy to make all her foods from scratch? I sure do. When I was working a 9-to-5 desk job, I’d often sit there are think “When I quit my job and work for myself full time, I’ll make homemade bread and homemade energy bars and homemade fruit snacks…” or, “When I have kids, I’ll make all their food from scratch and sneak in all the veggies and superfoods and they’ll love it and will eat everything I give them” (ha!) You get the idea. Now that I AM working for myself, I’ve had a bit more time to work on this “food from scratch” idea, but it’s been a bit of a slow process. I’ve been making more yeasted breads, overnight breakfast pastries and homemade ice creams, and I must admit they’ve all been so much better than the store-bought versions, but I still find myself taking the “easy out” more often than not. 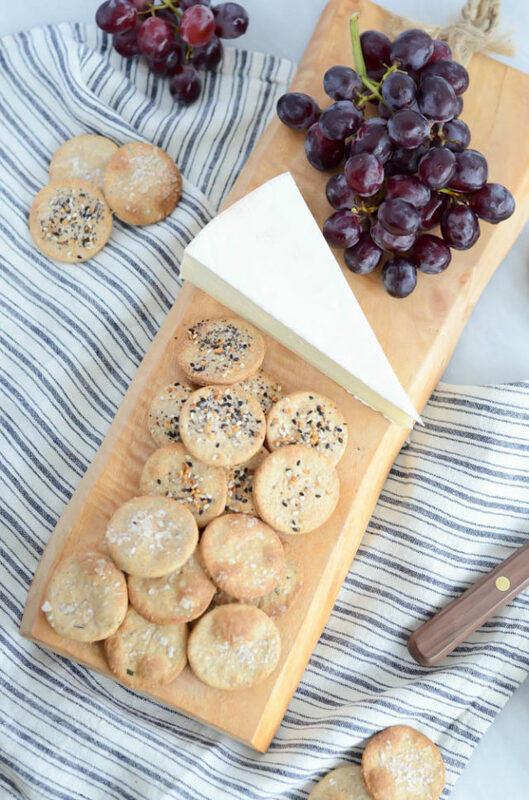 But having checked quite a few of these “To Conquer” items off of my list, I decided it was finally time to tackle one essential that we ALWAYS have on hand because of our deep love for all things cheese and charcuterie – homemade crackers! My initial internet research led me to this article from TheKitchn: “How to Make Crackers at Home,” and I used this along with a couple other bloggers’ recipes for inspiration in making my own version of Homemade Whole Wheat Crackers. And let’s talk about the whole “Two Ways” thing, because it may just be the best part of this recipe! Yes, I wanted my crackers to pair well with all cheeses, but that doesn’t mean we can’t jazz them up a bit! I chose two flavors that I felt would really compliment most (if not all) types of cheese – hard or soft, stinky or sharp. I laced my first batch of cracker dough with chopped fresh rosemary, then topped the crackers with Maldon sea salt. Yum!! I left the second batch of dough plain, but then topped the finished crackers with my new favorite product from Trader Joe’s – Everything But the Bagel Sesame Seasoning Blend! Seriously, if you have a TJ’s anywhere near you, I highly recommend you go out and grab a jar of this right away. (It’s also a new favorite of mine for jazzing up avocado toast!) If you don’t have a TJ’s near you, you can hit up Amazon, or TheKitchn’s got you covered yet again with this article on How To Make Everything Bagel Spice. Even if you have to make your own, it is soooo worth having on hand. The process of making this Homemade Whole Wheat Crackers is as easy (if not easier) than making a batch of cookies. Once you have the technique down, you’ll be pumping out dozens of crackers in under an hour. So worth making for your next party! The one thing I will say about this recipe is that, unlike store-bought crackers that are usually pumped full of preservatives, these crackers won’t keep for weeks on end. I highly recommend eating them within a couple of days of making them, or they may get a little chewy. This will also happen if your cracker dough is too thick when you cut it. Really make sure it’s thin enough so you get that fantastic crisp! And with these pointers, I leave you with the recipe(s). I hope you enjoy making these as much as I did! This post contains affiliate links. As always, all thoughts and opinions are my own. Thank you for continuing to support the brands that make CaliGirl Cooking possible! 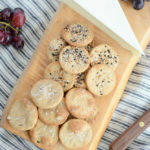 A simple homemade whole wheat cracker recipe with two flavor-filled variations - Rosemary Sea Salt and Everything Bagel! Preheat the oven to 450 degrees Fahrenheit. Cover two large baking sheets with parchment paper. In a large mixing bowl, combine the flours, salt and rosemary (if using.) Add the oil and milk. Divide the dough in half so it’s easier to work with. Take the first half of the dough and roll it out to about 1/8-inch thickness on a floured surface or another sheet of parchment paper. 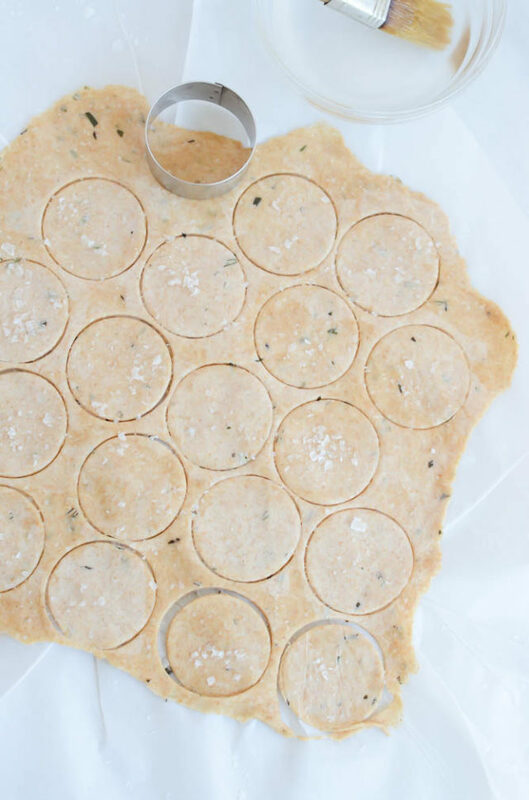 Using a 2-inch round culinary ring or cookie cutter, cut out the crackers. Gather and re-roll dough as needed until you have cut as many circles as you can. 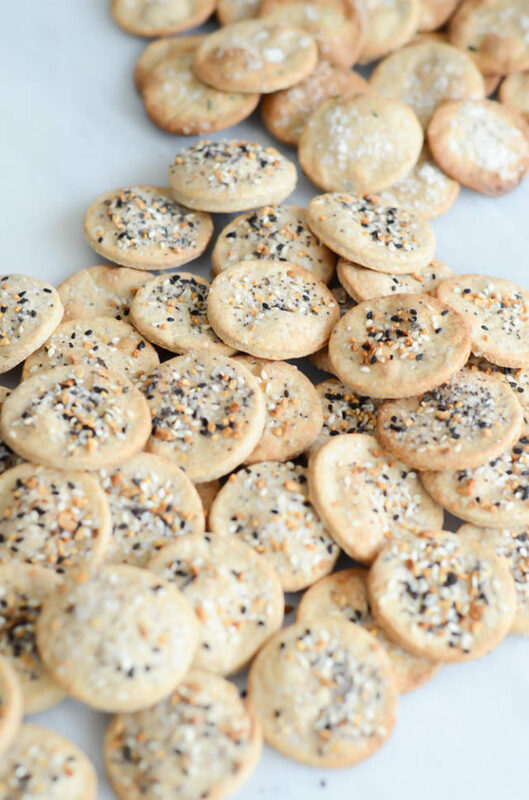 Brush crackers lightly with water using a pastry brush and add toppings (sea salt or Everything Bagel Seasoning.) Place crackers on prepared baking sheet (they don’t have to be too far apart, they won’t spread too much) and bake in 450-degree oven for 10-12 minutes, or until crackers are just golden. Remove from oven and transfer to a wire rack to cool. Let cool completely before transferring to a resealable container or plastic bag for storage. For best results, enjoy within a couple of days. Head to TheKitchn to learn How to Make Everything Bagel Spice.